What would happen if you woke up in a dark, metal box with no memory to speak of? The only thing you do remember is your first name. Welcome to Thomas’ predicament. When the lift’s doors open, Thomas steps into an unknown place called “the Glade,” whose massive stone walls close at night to keep the beasties at bay. He’s stuck in a giant labyrinth with no way out and surrounded by boys who are just like him—lacking a memory, adults or a foreseeable solution. All they know is that every 30 days a boy is delivered to the Glade and they need to find a way out. Then one day, everything changes. A girl is sent up in the lift with a shocking message that sets to destroy the safe haven they’ve created in the Glade. Suddenly, all of their lives hinge on Thomas and the dark memories buried deep within his mind. Will they all survive to find their way back home? I’m a total sucker for dystopias. Give me an impossible situation in a grave setting with characters fighting for their lives and I’ll eat it right up. It’s been my experience, however, that when a book like this is super hyped up, it rarely meets my expectations. Unfortunately, such was the case with The Maze Runner. And I’m not even saying the book was bad, it was quite good in fact, but I feel like it could have been so much more. Overall, I loved the premise—the unsolvable maze, the Lord of the Flies-esque society and the high impact ending. Ohmygosh the ending! But man, why did Thomas have to be so annoying? And what was with the deal with him and his inevitable connection with the girl, Teresa? Aren’t dystopias supposed to have a clear anti-establishment message, because I totally didn’t get much of one here. There were just too many questions and not nearly enough answers. So let’s start with the bad. I think my biggest problem was how drawn out this book was. Dashner could’ve cut out about 100 pages and it would’ve been so much less redundant. Thomas just asked the same questions over and over again. Look, I get it. He’s the newb and wants to be in the know, but like Thomas, I became frustrated because I wasn’t given enough information. And speaking of Thomas, he was an awfully cranky chap, not all that likable for our main character. I found him to be rather one note and that, for me, is a huge bummer. My biggest issue was with the pacing though. It’s all wrong. We hit the ground running in the beginning but then it draws to a lull throughout much of the middle. I feel like Dashner didn’t stress the direness of their situation until the last quarter of the book which is crucial in an action-based dystopia. But even with the drawbacks The Maze Runner’s pros outnumber the cons. I won’t give away the ending (it’s best left to be read), but man, it’s a fiery one! Dashner totally nailed it. And though Thomas and I will never quite be BFF’s there are several characters who I wouldn’t hesitate to hang with. First, there’s Gally. Okay, not so pleasant but I do admire his tenacity. He has his reasons for being distrustful and you do come to find out why. The veritable leader of the gang, Newt, is sharp as a tack and super reasonable. It’s easy to see why he’s chosen to be the head honcho. And there’s Chuck. Oh, Chuckie. He’s the “Piggy” of our crew (re: Lord of the Flies)— aloof, kind of a nerd and 100% loveable. Now we come to, who I think is the star of the show. Minho is a “runner,” one of the few who goes out and explores the maze by day, mapping all of its secrets. He’s the sarcastic, witty and adventurous friend that you always wanted. Crush alert: I’m smitten. It’s characters like him that charmed their way into my heart throughout this story. All in all, Dashner has done a decent job of puzzling not only the characters but the reader as well. Never once did I have an inkling of who was doing this to the boys and why. I was left guessing to the very end. Oh and what an end! It comes out of left field and pummels you (in a good way) with surprise. The only thing more surprising than the ending was the fact that it didn’t quite reach the level that I thought it would or could. I was expecting something more, a deeper message that just wasn’t there. The Maze Runner didn’t satiate me in the way that other dystopias have. Be that as it may, it is an engaging read that’s enjoyable enough to bring me back for book #2. 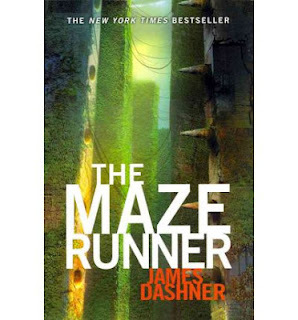 If you set aside my nitpicking, The Maze Runner really is a quick and entertaining read. And though it didn’t live up to its amazeballs potential, I liked it enough to want to continue on with the series. It’s a great introductory to the dystopian genre for those who don’t want to think too hard but still love an exciting journey. You can read an excerpt online here. I love good dystopia too. Sorry this one missed the mark a bit, glad you still enjoyed it. Isn't it nice to find a new literary crush? Hope the next in the series is great.